In Akira Kurosawa’s “Dreams” one of the scenes involves a day when it rains when the sun shines, a day when children are advised to play indoors because the foxes have their weddings, and do not like to be seen, but a boy disobeys, and watches anyway, and gets in trouble. 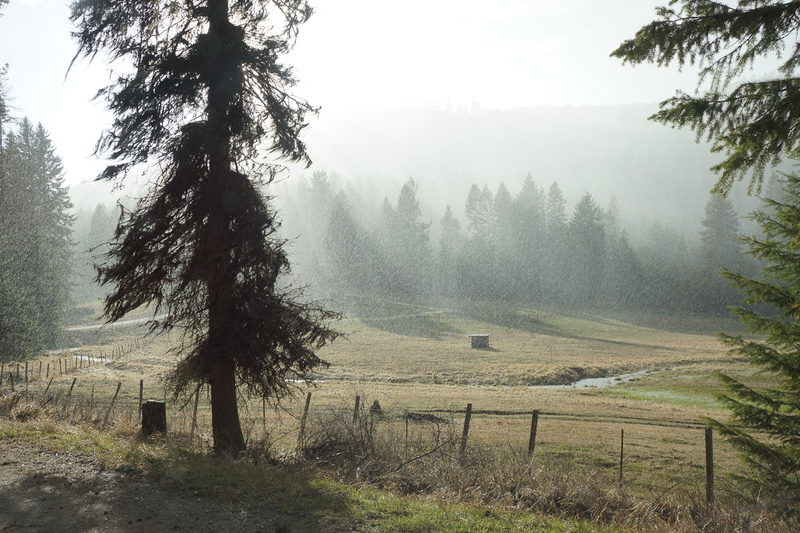 I thought of that scene today when a funny spring storm, with bright sunshine and rain mixed with snow fell just as we were leaving our farm and heading back to Spokane. We have splendid views of the sky to the west and the south, but both the north and the east are hidden by mountains, so when weather comes from those directions, it feels like it’s on top of us before we can see it coming. I did not see any foxes, and doubt if they were getting married—as a matter of fact, I’m not sure that foxes are common in our neck of the woods—we do see lots of deer and turkeys, and an occasional coyote. But the light of sun shining through rain mixed with snow is definitely strange, magical. 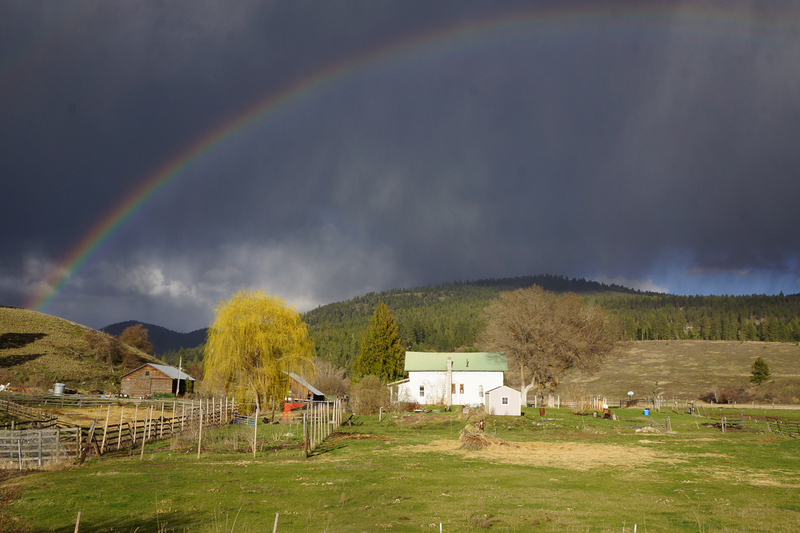 Driving into the farm earlier in the week, we were playing Israel Kamakawiwo’ole’s version of “Somewhere over the rainbow”—the one where he gets the words all wrong but gets the song so right—and when we left today, there was a rainbow over the whole canyon. Who knows how our lives will go—but wonderful things happen when rain and sun mix—maybe foxes do marry—maybe magic things happen—maybe dreams do come true. What an interesting touchstone for me. Kurosawa and Townes Van Zandt. My friend, Loretta was a good friend of Townes and often talks about him. You probably know the song. She’s coming through town next weekend. Maybe we’ll see a rainbow? From what I have seen from your posts, your farm does not have the low-level threat of intrusion so common to such places in America. I remember how the fight to keep the ambiance of old New England was slowly being lost to modern commerce around Amherst when I was a grad student at U Mass in the middle 60s. Not only the new structures, but the subtle pressure on other property owners to do something profitable with their assets. That had already happened to the prairie landscape of our farmland in Kansas in the 1950s where it became difficult to get out of sight of some billboard or some split level placed in the middle of a once productive field with no landscaping. I would like to see more of your photographic interpretation of this. You have the eye for it. It’s an onion snow, “Snow and Sun”. It is. It is nature reminding us that it is time to plant onions. Planting time varies from location to location, so April 12th must have been right for Evans, WA. What’s the etymology of “Onion snow?” My guess is that it is that luminous quality of a peeled onion. Or maybe onion skin parchment. It’s naming something seen that is transitory but memorable. The term has no author that I know of, it probably rose up into our vocabulary out of popular acclimation.